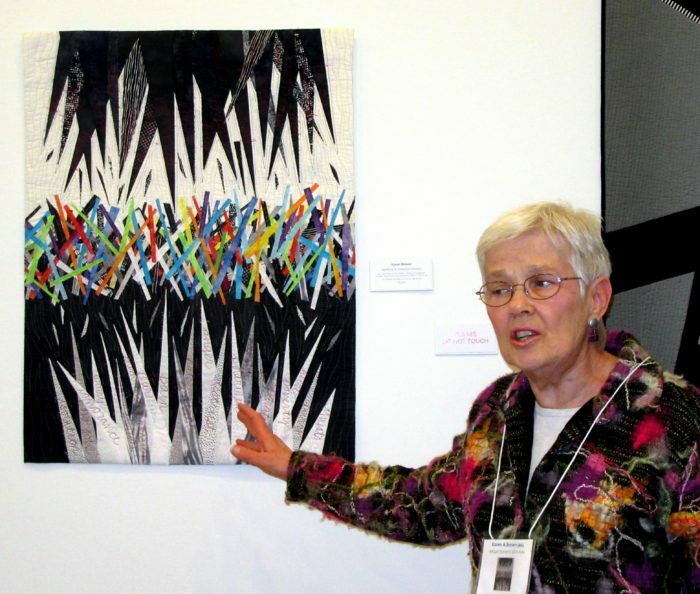 What a privilege and thrill, every other year, to see the Art Quilt Elements show at the Wayne Art Center. An even bigger adrenaline rush to be there at the Artists’ Reception, to be able to catch up with many friends and make new connections. 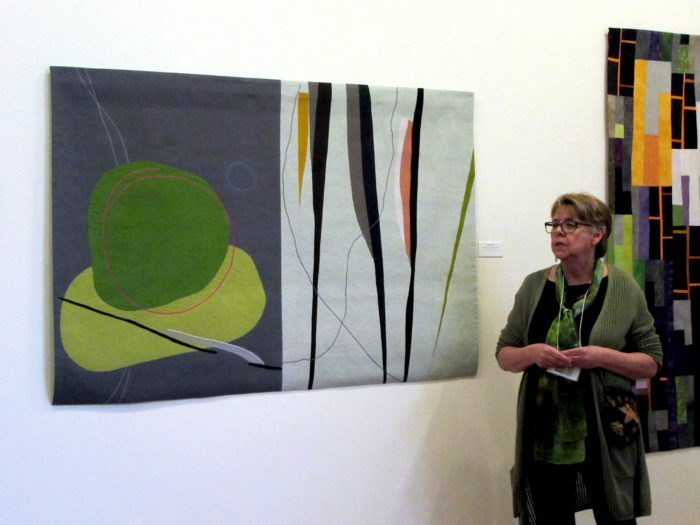 To hear the makers talk about their work, is it just coincidence how many works are about the ability or inability to make connections in our country, and in our world? 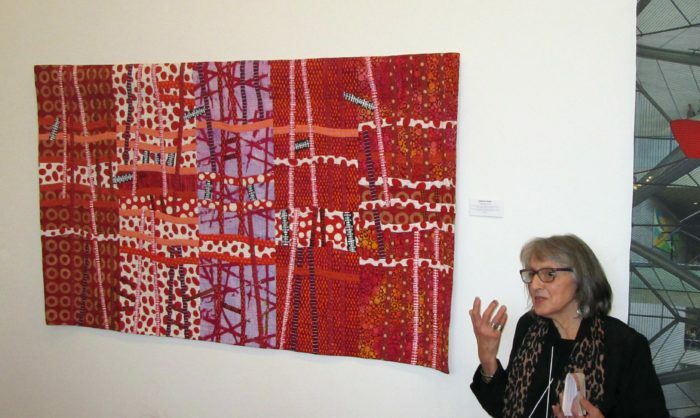 Transfusion #3, by Catherine W. Smith: Lines of red fabric like a blood transfusion that flows from one body to another. Structurally Unsound, by Diane Savona. Assembled from Salvation Army jackets, sweaters, and the clothes of workers, and embedded with construction tools. Expresses a deep concern for our rich, powerful country that does not have the political will to maintain our roads, bridges, and railroads that allow us to connect. Juxtaposition 1: Crossing Lines, by Karen Schulz. We are taught not to divide our art in half, but Karen achieves a dialogue, one half with the other, and strikes a balance. Conversation, by Marti Plager. “Is it possible for opposing sides to have a conversation? Is it wishful thinking on my part that the conversation can be a civil one? This poorly photographed collection of beautiful works and their beautiful makers pushes me to research and save up for a better camera. 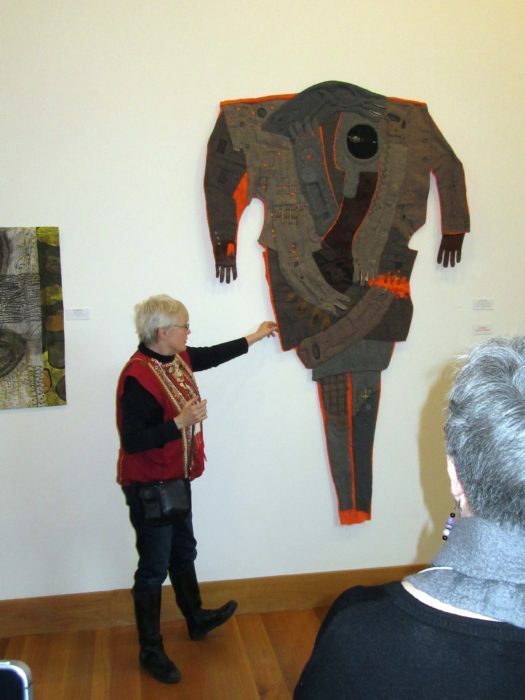 I only hope it pushes you to get to the Wayne Art Center, in Wayne PA, by April 28, to see these powerful pieces in the cloth! 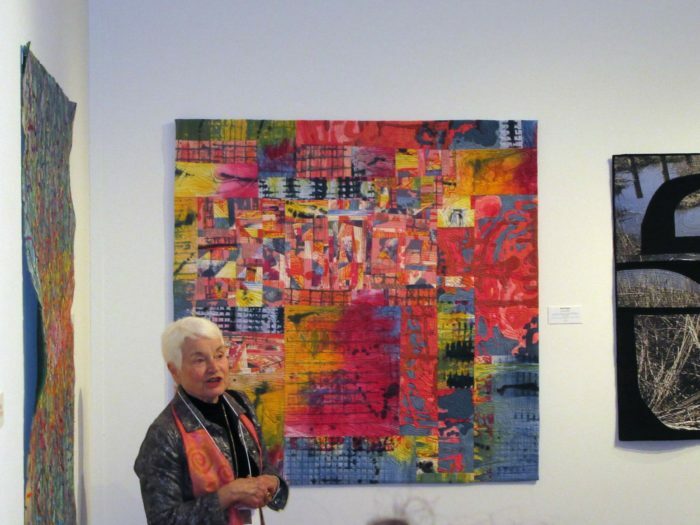 This entry was posted on Monday, March 19th, 2018 at 2:36 pm	and is filed under Art + Quilt, Exhibitions, Inspiration, Personally Speaking. You can follow any responses to this entry through the RSS 2.0 feed. You can leave a response, or trackback from your own site.